Looking for free summer printables? This free printable succulent wall art is perfect for an adorable, modern, summer style. Our numerous windows in our home don’t leave me with much wall space (side note: not complaining… just stating a fact 😉 ), but I do have a couple of go-to spots in our home that I think are fun to update seasonally with a little free printable. 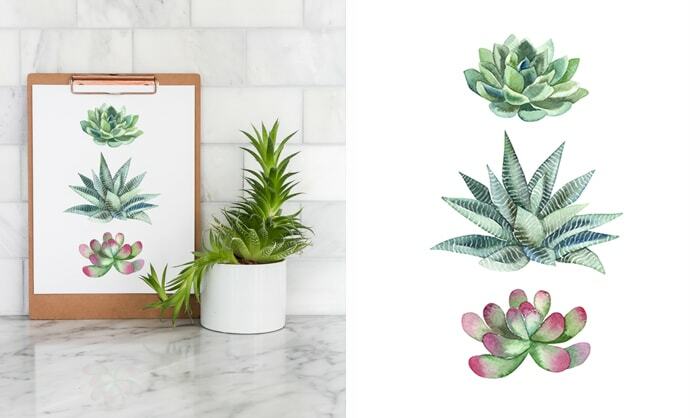 And, naturally, this watercolor succulent art seemed perfect for summer. So I brought my air plants and my funky aloe (seriously, this thing cracks me up the way it grows!) from other spots in our home. This is where we store our outdoor serving ware: non breakable, of course, for kid-friendly poolside fun. I think the touches of green are just the right touch of life for the space. Subscribe to gain access to the full printable library! The printable is sized to 8.5×11 so you can print it straight from your home printer, but the resolution is high enough to print a bit larger if you want. Please remember that this is for personal use only. Feel free to pin it for later, too! I’m so honored to join my friend Krista from The Happy Housie for this little project! Many talented bloggers are sharing their free summer printables today, so check them out and try a few! So cute, Rachel! 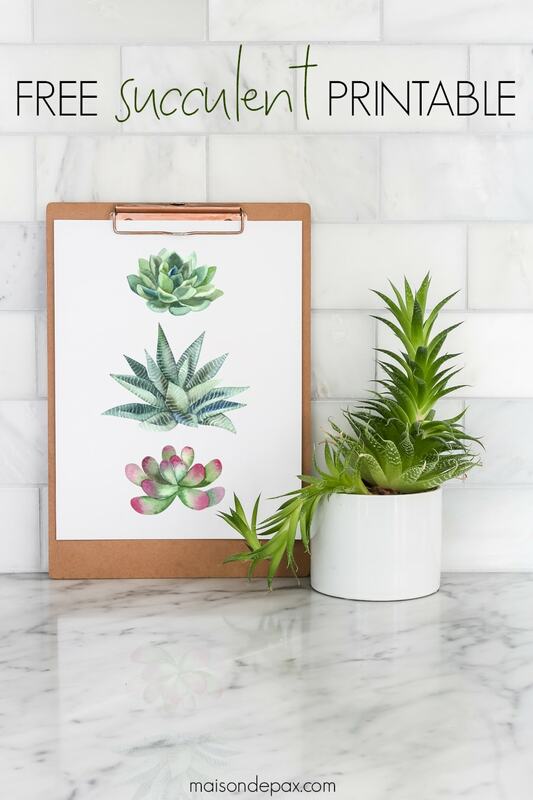 I love succulents, and this is so perfect for summer! Hope you’re having a great week! Can you tell me how to get a clipboard with a copper colored clasp? 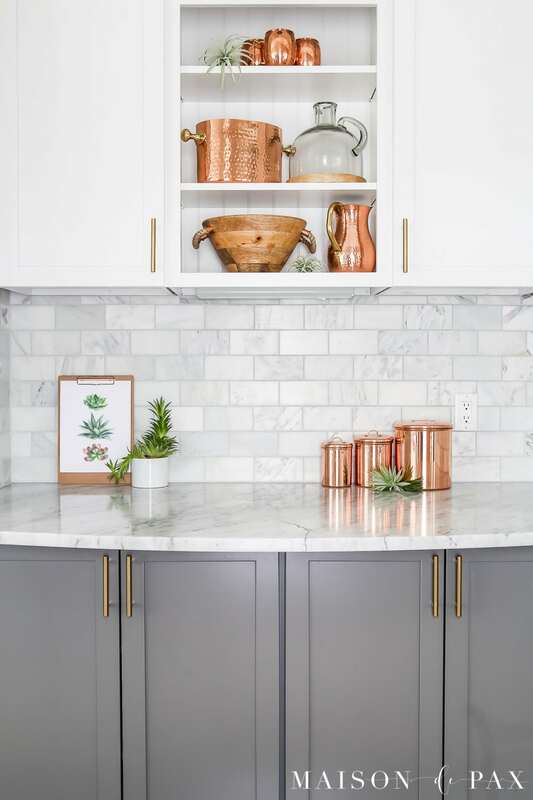 I love how you mix metal colors throughout your home!! Thank you, Jackie! Mixing metals is one of my favorite things. 🙂 I actually made the clipboard using (affiliate links) a pack of clipboards from Amazon and some Autumn Gold rub ‘n buff. If you decide to dry it, be sure to rough up the metal with sandpaper before applying the rub n buff. I hope this helps! Hello from Australia. Great paintings! Regarding the heat and gardening, we get high heat here too, some Summers in the mid 40s centigrade! Have you tried growing Gazanias, lavender, rosemary, geraniums, fuchsias , agapanthus even roses? I do. We just water the roses and gazanias morning and night on those very hot days. I think gazanias (from South Africa) don’t even need that much as the municipalities use them in the middle of roads in some towns here. They come in yellow, orange, cream and pink flowers. The others mentioned are ok if they miss some watering days. We do use mulch on the soil, and compost mixed into the soil holds the moisture longer. 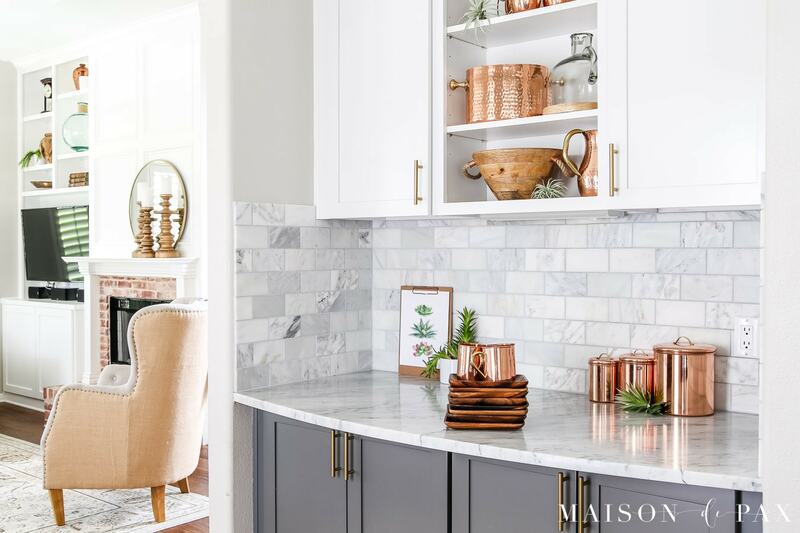 We have square wooden plates just like you, and copper in our home too. Those are some good ideas! We do get quite a bit of rain, but watering in the morning or evening does help with evaporation! Your garden sounds beautiful! I can never get enough succulents! 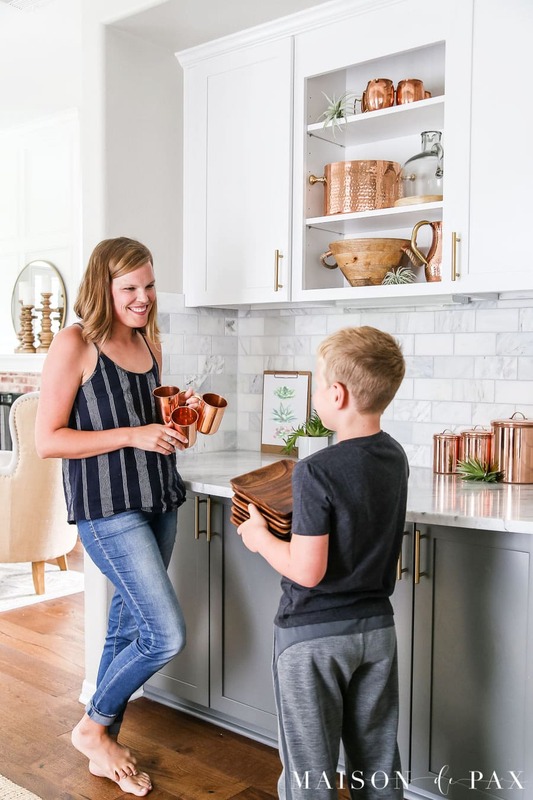 Such a cute printable and I love all of the copper in your kitchen. So pretty! You are too sweet, Summer! Thanks for stopping by! 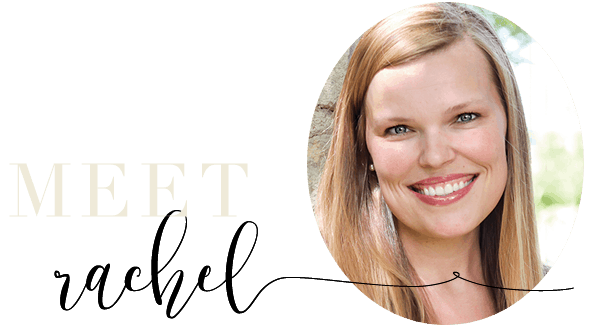 I adore this, Rachel! So simple and pretty! Thanks for joining in on this hop, friend! Happy summer! This printable is so cute! Love reading each of your posts and drooling over your photography! 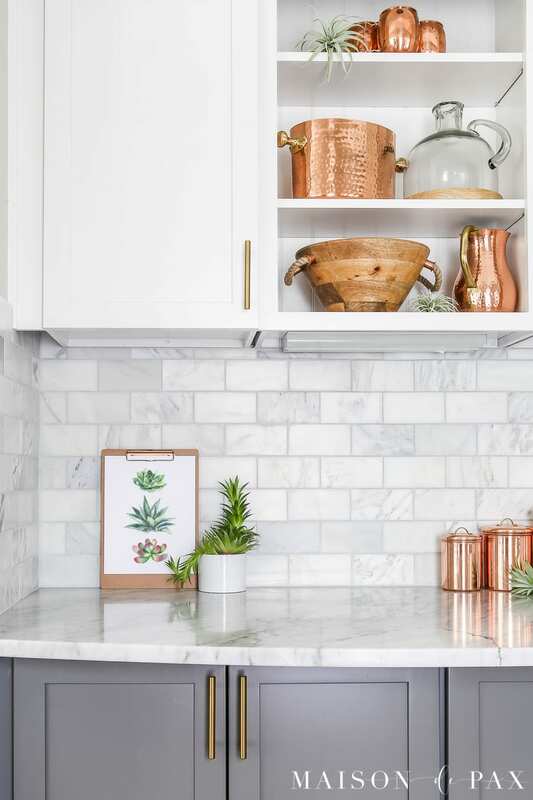 What is the backsplash that was used in this kitchen picture? Is it marble? I would like to know the product and color name?